Estimates of average annual tributary inflow to the lower Colorado River, Hoover Dam to Mexico; 1987; WRI; 87-4078; Owen-Joyce, Sandra J. Progress report on the ground-water, surface-water, and quality-of-water monitoring program, Black Mesa area, northeastern Arizona, 1987; 1987; OFR; 87-458; Hill, G. W.; Sottilare, J. P.
Evapotranspiration estimates using remote-sensing data, Parker and Palo Verde valleys, Arizona and California; 1986; OFR; 86-67; Raymond, L. H.; Rezin, K. V.
Hill, George W.; Whetten, Marlin I. 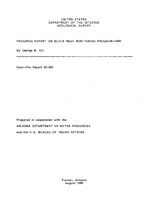 Progress report on Black Mesa monitoring program; 1985-86; 1986; OFR; 86-414-W; Hill, George W.; Whetten, Marlin I. 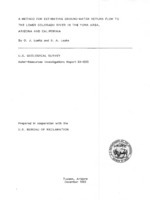 Progress report on Black Mesa monitoring program, 1984; 1985; OFR; 85-483; Hill, G. W.
A method for estimating ground-water return flow to the Colorado River in the Palo Verde-Cibola area, California and Arizona; 1984; WRI; 84-4236; Owen-Joyce, Sandra J. A method for estimating ground-water return flow to the Colorado River in the Parker area, Arizona and California; 1984; WRI; 84-4229; Leake, S. A.
Loeltz, Omar J.; Leake, S.A.
A method for estimating ground-water return flow to the lower Colorado River in the Yuma area, Arizona and California; 1983; WRI; 83-4220; Loeltz, O. J.; Leake, S. A. 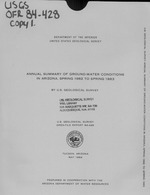 A method for estimating ground-water return flow to the lower Colorado River in the Yuma area, Arizona and California; executive summary; 1983; WRI; 83-4221; Loeltz, O. J.; Leake, S. A. Dust carried by the wind has far-reaching effects, including the loss of nutrients and water-holding capacity from landscapes, and the speeding up of the melting of snow, which affects the timing and magnitude of runoff into streams and rivers. Stream gaging occurring in Winslow: Clear Creek and Little Colorado River. Flooding taking place at Grand falls. Staff at the USGS Central Region Library created two displays for an open-house in celebration of National Library Week, April, 2010. This display on USGS scientific investigtations of the Grand Canyon displays field records, historical photography,historical surveying equipment, and publications from the science areas of biology, geology, geography, and water. Explaning why USGS streamgagers make discharge measurements. Measuring low flow in the San Pedro River with flume. FLAGSTAFF, Ariz. — The U.S. Geological Survey has named Kate Kitchell the director of its Southwest Biological Science Center. Kitchell, who served as the acting center director for the previous 16 months, assumed the role permanently November 6, 2010. TEMPE, Ariz. — Climate change and growing human demands for water are leaving an indelible mark on rivers and streams, shortening food chains and eliminating some top predators like large-bodied fish, according to a new study led by Arizona State University and co-authored by a U.S. Geological Survey scientist. Flagstaff, Ariz. — As part of the Department of the Interior’s evaluation of whether to segregate nearly 1 million acres of federal lands near the Grand Canyon from new uranium claims, the United States Geological Survey today released a report on uranium resources and uranium mining impacts in the area. Flagstaff, Ariz. —Resources along the Colorado River in Glen Canyon National Recreation Area and Grand Canyon National Park generally benefited from a high-flow experiment conducted in March 2008 from Glen Canyon Dam, near Page, Ariz., according to research findings released today by the U.S. Geological Survey. Greater sage-grouse populations have declined substantially in many areas in the West, though populations in some locations remain relatively stable, according to a comprehensive publication written by federal, state, and non-governmental organizations. The population assessment is one of numerous sage-grouse topics covered in the 24 chapters released today. U.S. Geological Survey scientists and cartographers played an important but relatively unknown role during the Apollo 11 moon landing 40 years ago this week. USGS astrogeologists trained the Apollo astronauts in the science and strategy of field geology. Critical science support for NASA's Lunar Reconnaissance Orbiter (LRO), launched today from Cape Canaveral, Florida, will help pave the way for further human and robotic exploration of the Moon. U.S. Geological Survey scientists are providing unique knowledge and skills as members of the science teams operating instruments on LRO. The U.S. Geological Survey will conduct scientific overflights at Grand Canyon National Park, Arizona, during Memorial Day weekend to document the status of natural and cultural resources along the Colorado River below Glen Canyon Dam. Aerial photographs will be taken using two fixed-wing aircraft flying at an elevation about 7,000 feet above ground level. Adult endangered humpback chub (Gila cypha) in Grand Canyon, Arizona, increased by about 50 percent between 2001 and 2008, according to analysis recently conducted by the U.S. Geological Survey. The upward trend reverses population declines from 1989 to 2001. U.S. Geological Survey scientists will brief reporters by phone at 3:00 pm Eastern Daylight Time/12:00 pm Mountain Standard Time. Monday, April 27, on the latest population numbers for the humpback chub (Gila cypha) in Grand Canyon, Arizona.